Self Help Meditation Shortcuts That Promote Spiritual Inspiration And Intuition! Self Help Meditation Shortcuts Open The Door Within! Use these self help meditation shortcuts to help you to slow down or stop your internal dialogue, the continual self-chatter that’s repeated, over and over, in your mind. Once your mind is quiet then the door within will open and you’ll gain access to real spiritual inspirations and greater understanding. Real spiritual intelligence lies within your own mind. However, as long as your mind is full of noise you might not be able to receive the spiritual intuition and spiritual inspirations coming from within your own being. That is to say, unless your mind is quiet from the usual constant noise you won’t hear the messages that are continually being broadcast to you by your higher self. If your desire is to seek answers to your life challenges, then meditation might be an invaluable tool for you to use. Because once you've mastered meditation - intuition and inspiration will naturally flow to you. Therefore, practicing these self help meditation shortcuts will be of great assistance in helping you to access that real spiritual intelligence. Due to my life experience and research into religion and spiritual belief systems I'd developed an interest in Thai Buddhism. This was mainly because during the several years I spent traveling extensively throughout Thailand, I'd met several Westerners who'd donned the orange robe, some of them for more than 20 years. My curiosity as to "why they did so" had become a burning desire to find out for myself! Thus, many years ago I spent 3 weeks in a Thai monastery near the town of Ubon Ratchathani in the Northeastern province of Thailand (near the Cambodian border.) As I was on a spiritual quest I went into the monastery partly due to my burning desire to find out about Thai Buddhism, particularly the Thai Forest Tradition of Buddhism. During my stay as a novice at the monastery I was able to communicate with Western and Thai monks and thereby satisfy my curiosity. While I love and appreciate Buddha's wisdom and intelligence, the idea of Buddhism or other spiritual belief systems has never really appealed to me. Ultimately I discovered, first hand, that being a monk was not my path. But I did learn a lot about the benefits of practicing meditation. I've never been attracted to organized religion or spiritual belief systems. However, I was very interested in learning how to still my mind through meditation, because I believed and felt that reducing or stopping one’s internal dialogue was the key to gaining more awareness and spiritual inspirations. If there's no space in our mind due to constant and continuous self-chatter, then there's no room or space for any new information to flow into. If our head is full of noise, then we’re not allowing the intuition, insights and spiritual inspirations, which are always there, to naturally flow to us. So meditation is practiced in order to still our minds and to look within. Meditation is very beneficial to us because when our mind is quiet, we’re allowing the natural flow of information from within our being, from our spiritual higher self to reach our conscious physical mind. The busier your mind is the more stressed you are. The more stressed you are the longer you need to meditate! And what is that Source? Some people call it the Universe or God or Love and many other labels are applied. None of those labels represent absolute truth, but they might be helpful for grasping the meaning of something abstract, something that's unnameable and unknowable as an absolute! Another way to look at it is to see your individual mind as being connected to the greater collective mind of humanity - the storehouse of all human experience and memory since the beginning of human existence. 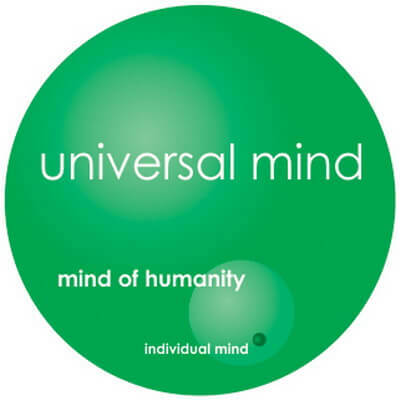 This mind of humanity is in turn connected to the even greater mind of Source or God, or simply the Universal mind. Of course, no real division or separation of these minds actually exists, as they're all one. However, language and concepts are helpful for getting to grips with something that's larger than and which encompasses, contains and IS all of All That Is, including all rationality, reason and logic. Now, I’ll go through a couple of systems of meditation that I’ve practiced which might be helpful to you. The first one is the meditation system that I first learned from the monks and practiced in Thailand. It’s helpful to make sure that you won’t be disturbed for ten to twenty minutes. Sit (cross legged) with back straight on a mat on the floor or on a comfortable chair in a dimly lit room. I like to have the windows open so that air circulates creating a breeze. Set an alarm clock to sound in ten to twenty minutes. Close your eyes and rest your hands in your lap. Now inhale deeply through your nose and see and feel your breath going down into your lungs. Hold it there for one or two seconds before slowly exhaling through your mouth, while at the same time watching and feeling your breath as it goes all the way out. That’s sitting meditation. Wait a couple of seconds and keep repeating the above process. Take it nice and slowly, there's no need to rush. Only pay attention to your breath and the action of breathing. See if your mind can stay with it. After a while you might notice that your mind has wandered and that you’re daydreaming, relax, that’s perfectly normal in the beginning. The more you practice, the less your mind will wander off and then you’ll begin to know the benefits of meditation. In a sense, the action of training your mind is assisting you to become more aware of what’s actually taking place in your mind, only now you’re becoming aware of it. Start practicing sitting meditation for ten, fifteen or twenty minutes per day or whatever you feel comfortable with, it’s really up to you. I first heard about this system of meditation from reading the Carlos Castaneda books relating to "The Teaching's of Don Juan." 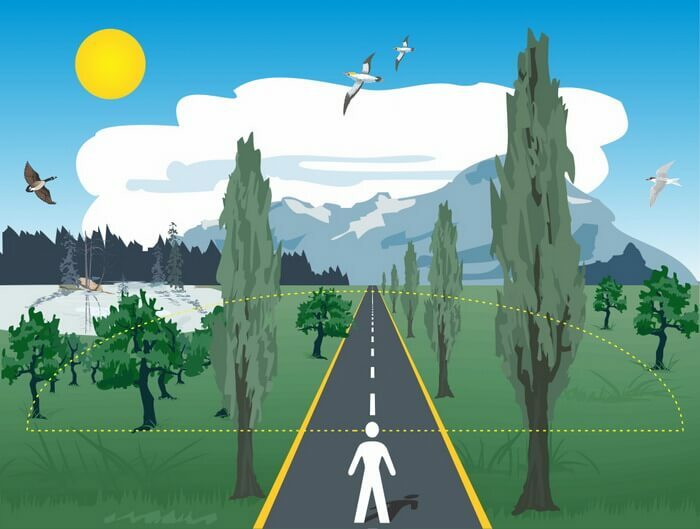 Find a quiet road or field or anywhere that you can walk safely in a straight line for five to fifteen minutes. The idea is that you don’t want to be disturbed by vehicles or crowds while practicing walking meditation. Now, slowly walk along the quiet road while being aware of and taking in every sight to the peripheral of your vision, as well as noticing every sound near and far. In addition, feel the breeze and the warm sun or the cold air on your skin and smell the scent of flowers, animals or rain etcetera all around you. Walk slowly and pay attention to those things. See if your mind can stay with it. This image represents the idea of practicing walking meditation. That’s when the deeper more meaningful spiritual inspirations and insights will enter your consciousness. It takes practice, but it’s very rewarding. Self Help Meditation Shortcuts – Which System of Meditation? While these self help meditation shortcuts will definitely help you get into a meditative state, it’s worth bearing in mind that no system of meditation is absolutely necessary. Quieting your mind is the goal, so whatever you do that helps you to get into a meditative state is valid and helpful. Walking in nature, listening to the ocean or a lovely flowing river, watching a beautiful sunrise or sunset, listening to your favorite music or even reading a great spiritual book, such as Eckhart Tolle's 'Stillness Speaks,' can all help you to enter into a meditative state. I’ve often used all of the above meditation shortcuts and other systems of meditation. I meditate in order to enter into a quieter state of mind, and then I’m able to receive intuition, insights and spiritual inspirations as answers and solutions to any questions and challenges that have been on my mind. Some might call this real spiritual intelligence. On a deeper level, practicing meditation can help us to open the gateway for consciously connecting to our spiritual higher self and beyond that to even higher frequency spiritual awareness. Our higher self is like the gatekeeper to the spiritual realms which lie beyond it and it acts as an interpreter for higher frequency communication from spirit. Yes, our higher self serves as an interpreter to the spiritual reality that’s vibrationally outside of the scope and awareness of our everyday consciousness. Without your higher self, you would not be able to understand the messages coming to you from what you perceive as your guides, angels and spirits who’ve passed over. Thus, realize that when you’re communicating with any kind of spiritual being, the messages are first interpreted by your higher self and then sent to your physical mind in ways that make sense to it via the channel of your own imagination. This psychological self help page goes into more detail concerning the higher self. Another way to consciously connect to your higher self and beyond is to think only pure positive thoughts. Pure positive thoughts do not contain resistance in the form of: I want it but I can’t have it, I’d like it but I don’t deserve it and it sounds right but I don’t believe it etcetera. Always remember that you’re the boss. Your reality, your story, all of it, is first imagined and then believed in by you. When you oscillate between a pure thought, such as: I now choose a new job and I probably won’t find a new job, you’re right on both counts, so you remain where you are. If you can maintain a state of pure positive thought and appreciation for all that you already have, then you’ll realize even more of your desires. If you can't seem to maintain pure positive thoughts, then it’s better to practice meditation until your mind is mainly focused on positive things, and then you'll relax and enjoy more of your life. This self help meditation shortcut suggests that if you're generally in a relaxed and happy state, then practicing the art of appreciation, as covered in the Entry Level section, will enable you to realize all of your desires in the fastest time. The truth is that once you begin to use any of the self help meditation shortcuts indicated on this page, and you’ve gained a real understanding as to what meditation and its purpose really is, then you can meditate anywhere at any time. You can take a meditation time-out whenever you begin to feel stressed, depressed, frustrated or anxious. Simply momentarily stop whatever it is you’re doing and pay attention to your breath. Two or three conscious inhalations and exhalations will normally do the trick of bringing yourself back to focus. Once you've practiced these self help meditation shortcuts for a while you may begin to realize that you’re meditating often, without calling it meditation. By seeing the beauty all around you and always being aware of what’s going on inside and outside of you at all times, you've consciously entered into the eternal moment of NOW, in truth the only moment there ever is. I'll clarify the benefits of living in the now moment in the Reality Paradox section.